In 2015, a Ride the Ducks vehicle crashed into a charter bus on Aurora Bridge in Seattle. The collision killed five passengers on the bus and injured many more people. Investigators found hundreds of safety violations committed by the company; the cause of the crash was found to be an axle that snapped unexpectedly, causing the amphibious vehicle to veer out of its lane on the narrow bridge. Since then, Seattle’s Ride the Ducks tour vehicles have come under intense scrutiny. The Ducks were eventually allowed to resume operating on the city’s streets, but in 2016, a Ride the Ducks vehicle collided with a sedan and the corner of 5th Avenue and Mercer Street. Later in 2016, another sedan’s rear end was crunched by a Ride the Ducks vehicle; the driver was attempting to get out of the way of an ambulance, and apparently didn’t see the smaller car in front of it. The vehicles’ high, curved hoods can make it hard for drivers to see smaller cars on the road, and their route takes them down some of Seattle’s busiest streets. On Sunday, March 19th, a Ride the Ducks vehicle was involved in yet another crash. 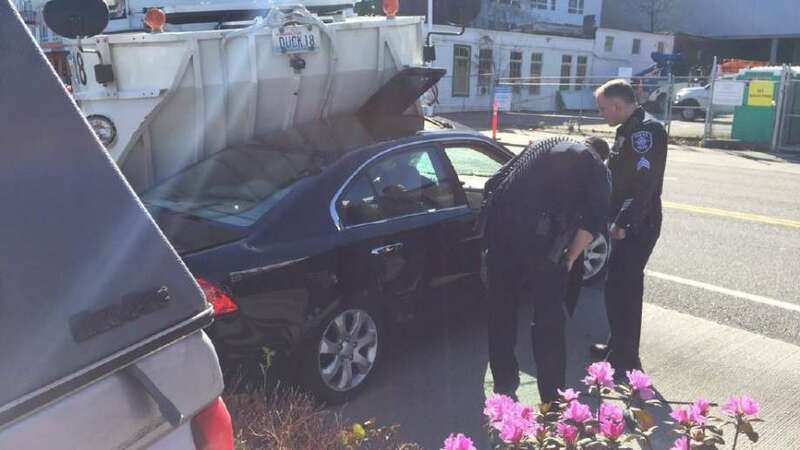 This time, a car was struck as it turned in front of one of the large, unwieldy amphibious vehicles in the 1200 block of Westlake Avenue North. "The duck went to go change lanes and hit the center of her car and spun her right in the middle of the road," one witness told reporters. According to witnesses at the scene, a small Kia sedan was in the Duck vehicle’s front blind spot, where the driver might not have been able to see it. The driver of the Kia suffered injuries to her hand. No other injuries were reported. Westlake Avenue is one of central Seattle’s busiest streets; the Ride the Ducks vehicles travel down the road to the spot where they enter the lake for the water portion of their amphibious tour. After the fatal 2015 crash, Ride the Ducks agreed to stop using the specific model of vehicle that had been involved in the crash. The “stretch ducks” used by the company were older vehicles; it now only uses newer models it calls “duck trucks.” In 2015, the company required the driver of the Duck vehicle to narrate tours while navigating busy streets. Now, a second employee works as a narrator while the driver focuses on the road. Company spokesman Mark Firmani also says that the Duck vehicles now have 365-degree video coverage. Still, safety advocates are concerned about the many drivers, bikers, and pedestrians who must share the road with the unwieldy Ducks. In addition to the 2015 crash, they point to an incident in 2011, in which a motorcyclist was struck and dragged by a Ride the Ducks vehicle. The victim of the crash suffered a crushed leg, arm, and pelvis. The amphibious vehicles that Ride the Ducks uses are based off models originally intended for use in wartime. Other types of amphibious vehicles, including amphibious buses, can share the road more easily and have a much smaller blind spot at the front of the vehicle.